The University of Johannesburg scored a trifecta of wins when its men’s hockey, squash and rugby teams took gold during the winter leg of the USSA national student tournaments. The squash and hockey teams successfully defended their titles, while the rugby squad took back the laurels after winning two years ago. According to UJ Sport’s senior manager for clubs Adrian Carter, the results confirm the university’s position among the top performing tertiary institutions in the country. UJ, the only team not to drop a game en route to the last round, beat the University of Pretoria 14-10 in the final of the squash championships in Port Elizabeth on July 5. On the same day, the institution overcame former rugby champions Stellenbosch University 29-16 to lift the trophy in Pretoria, while the hockey team claimed a 3-2 victory, also over Maties, in Cape Town. Carter said UJ participates annually in 12 of the 35 USSA sporting codes and a number of factors had led to his teams’ success this season. “We are well supported by the university from a financial perspective and with that comes the appointment of quality human resources in the form of sports managers, coaches, team managers, sports scientists and biokineticists. He said the university advocated a balanced approach when recruiting student-athletes. Carter said being affiliated to a top institution was vital for advancing any sporting career. UJ rower Kirsten McCann won gold in the women’s lightweight single sculls event, while Kate Christowitz helped the women’s coxless fours to a silver medal result. The real challenge, said Carter, was addressing the next development tier for the elite student-athletes once they leave university. 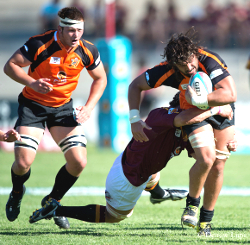 IMAGE: The University of Johannesburg’s RJ Liebenberg, who was named forward player of the tournament, evades a tackle in the recent USSA national student rugby championship final. UJ also took gold in the men’s hockey and squash tournaments.